Kevin Stricklin the administrator of coal mine safety for the Mine Safety and Health Administration, speaks at a MSHA briefing at the state Capital on Wednesday. The head of federal coal mine safety said Wednesday that regulators need to take a careful look at how to deal with the challenges presented by coal mining in Utah and whether a technique known as ''retreat mining,'' used at Crandall Canyon, can be done safely. Kevin Stricklin, the administrator of coal mine safety for the Mine Safety and Health Administration, said he has asked a team to review mine plans for every coal mine operating 1,500 feet or more underground - a depth common in Utah and rare in most other states. 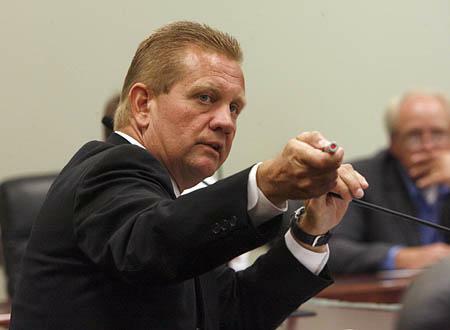 "I think we have to find a way to do it safely," Stricklin told Utah legislators during a capitol briefing on the Crandall Canyon collapse. "There's a uniqueness here that I don't think is anywhere else in the United States, maybe anywhere else in the world." As Utah's coal reserves become depleted, mines are forced to dig deeper and increasingly resort to techniques like retreat mining - in which the thick coal pillars supporting the roof are cut away, allowing the last bits of coal to be recovered and causing the roof to fall. Mining coal safely at those depths is a big part of the state's coal production over the next several years. The Crandall Canyon mine was cut miles into a coal seam with between 1,300 feet and 2,200 feet of mountain bearing down. Other Utah mines, like Aberdeen and West Ridge - two other mines owned by Crandall Canyon co-owner Robert Murray - and the Dugout mine are all under 3,000 feet of "overburden," as it is called. MSHA investigators are expected to arrive at the Crandall Canyon mine next week seeking to determine if mine operators deviated from the safety plan and to find ways to improve safety in the future. Already, investigators have been given access to MSHA records on the mine. When the team, made up of seven or eight MSHA officials from around the country, arrives in Utah they will review shift logs, look at every record in the mine office and determine who they want to put under oath to interview. That will likely include company officials and engineers from Agapito Associates, a consulting company hired by the mine operators, Stricklin said. "We want to see if we can get an inkling if there may have been an indication there was a problem before this event," he said. The investigations typically take a year to complete, but this one may take less time, since investigators won't be able to inspect the sites underground where the accident occurred. MSHA deputy assistant secretary Robert Friend, attending an international mine safety conference in Nashville, said that, in his experience, "When there are fatalities and serious injuries, invariably mine operators were not following their plans." That may not be the case here, but it is a possibility, he said. "We don't know at this point," he told The Salt Lake Tribune. "We will determine that during the investigation." Murray closed the Tower mine until, he said, he is confident it can be operated safely, idling about 170 workers. Stricklin said MSHA roof control experts were at Tower on Tuesday and the nearby West Ridge mine on Wednesday conducting reviews, and he expects them to make their recommendations by Friday. "Our intent isn't to shut the mine down for good. Our intent is to make sure it's safe for miners when they go back in," Stricklin said. In the long term, Stricklin said MSHA needs to work with experts from the National Institute of Occupational Safety and Health and universities to try to find ways to mine safely and, if possible, predict or control future mine ''bumps'' - the term for when pressure in the mountain shifts, causing coal to explode from the walls, roofs to cave in or floors to buckle and heave. Most eastern coal mines are much shallower, with the exception of Alabama, where mines can be 2,500 feet deep, but the ground above is flat, Stricklin noted. Specifically, he said, MSHA needs to evaluate the use of retreat mining in deep cover. At Crandall Canyon, records show that MSHA had approved cutting away the pillars in June, and the mine map shows retreat mining occurred in July near the area that collapsed Aug. 6, trapping six miners. Three additional miners were killed and six injured during rescue operations on Aug. 16. One of those who died was MSHA inspector Gary Jensen, the first federal mine inspector to die in the line of duty in more than 30 years. "This has been very tragic and we are taking it hard," Friend said of the deaths. Secretary of Labor Elaine Chao, addressing the mine safety experts in Nashville, announced that MSHA has named a special award in Jensen's honor that will be given at an award banquet today, which concludes a national mine rescue competition.